South Lodge is a refurbished and immaculately maintained 2 bedroom timbered cottage with comfortable and spacious living spaces and excellent facilities. Sleeps 4. Bedrooms: 2x double (or twins - your choice), single shared bathroom. Full kitchen inc. fan oven, grill, fridge, dishwasher, crockery, cutlery, washer-dryer. Lounge with sofa and armchair, Freeview TV & DVD player, conservatory, private garden overlooking the fields. Free Parking on site. Picture perfect whitewashed former farmers cottages in the heart of our rural Estate. Renovated to the highest standard our Lodges are comfortable and easy places to stay. Surrounded by private gardens they are both spacious and private offering top-quality accommodation in the heart of stunning rural North Essex. Fully fitted kitchens and living areas means you can relax in a home from home with Freeview TV and free Wifi (monthly ISP limits do apply to all cottages). Luxurious bedrooms and top-of-the range bathrooms give that luxury feel to make your holiday extra-special. 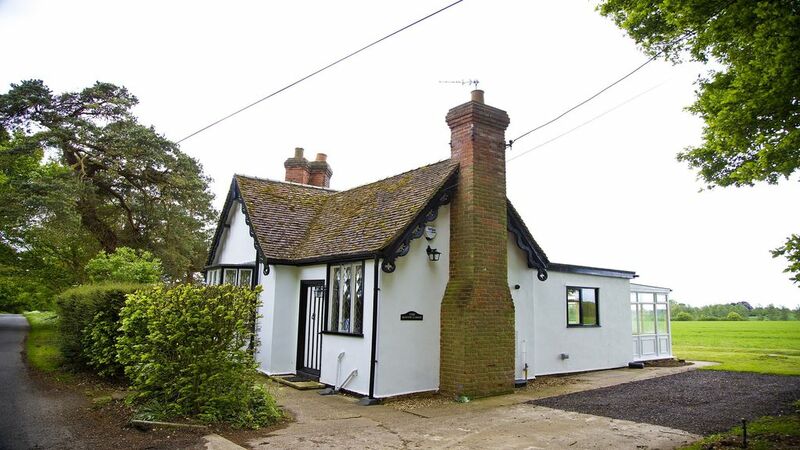 Situated on the Estate off a quiet rural road only 1 mile from the centre of the picturesque village of Finchingfield. All Lodges give you easy access to footpath walking on the Estate and delightful pubs, tea rooms and local deli within Finchingfield (10 mins walk). Further afield you are within easy reach of historic Thaxted and the thriving market town of Saffron Walden with the full range of amenities. Steps to access the property from all sides. Sorry. Great spot. Lovely views all round. Great nights sleep. Very warm and homely. Attention to detail 1st rate! Customer care with the sincerity. We have stayed at each lodge and have been thoroughly pleased with every visit. The peaceful and quiet serenity is a dose of medicine that is good for all of us, and you will find it here.The attention to detail and levels of cleanliness will bring us back time again. We had the opportunity to meet the charming Ann who puts her heart into preparing each lodge before your visit. Thank you Archie for helping me with the arrangements for my remembrance wreath. I hate to rush time, but we are looking forward to our return trip. The house we stayed in was the South Lodge which is well equipped and suitable for 2 couples or a family of 4. London is a 20 minute drive to the station in Braintree and then an hour by train to Liverpool Street Station. Also Cambridge is nearby as well as any number of quaint villages and places of interest. Car essential as we are in a very rural location although taxis can be arranged for transfers. Finchingfield Shops (2 mins drive): Post Office & Deli, Garage (with fuel x2), Tea Rooms, Italian Restaurant, 3 Pubs serving food, Craft Shop & Antiques. Saffron Walden (25 mins drive) - Market Town with market on Tuesdays & Saturdays, full amenities including supermarket, leisure centre, chemist, cash machines etc. Haverhill (20 mins drive) - Market Town with market on Fridays and Saturdays. Supermarkets, Cinema, Leisure Centre and restaurants.